“They’re swearing in Rachel Notley as Premier,” I replied. “Oh,” she said, and then again, “Oh,” as she quickened her stride to join the crowd jamming themselves into front part of the great public square outside the “Ledge” of the Western Canadian province, so they could hear the proceedings. I had walked over from my hotel and arrived about 25 minutes before the ceremonies were scheduled to start, so I could watch as the people drifted in through the heat like cottonwood from the heritage poplar trees, settling first along the edges of the square in the shade, and then mounting the sides and the edges of the deep pool. 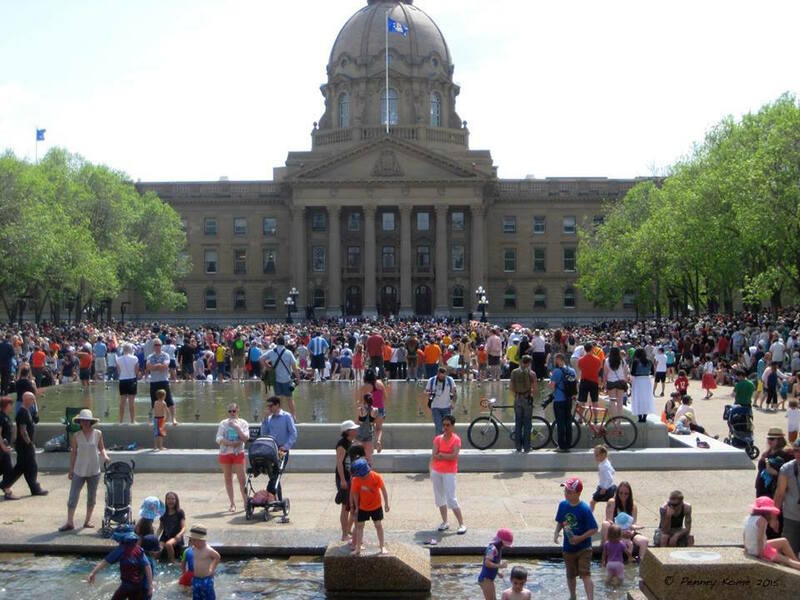 In the provincial capital of Edmonton, the immense Legislature plaza is a public space year round, like Toronto’s Nathan Philips Square, only terraced, and surrounded by a forest of sturdy pines and colourful elms, barberries and other seasonal trees. “The grounds were expanded north of the building in 1978 to celebrate the 75th anniversary of the province,” says the “Welcome to the Legislature” brochure. It continues, ”The project included the addition of the reflecting pool, fountains, wading pools, underground pedways and a new visitor centre. The project cost $62 million and was completed in 1982. “Today the Legislature Grounds feature 56 acres of manicured lawns and trees. Each spring over 100,000 annuals are planted in the gardens. In the hot summer months many people enjoy the fountains and wading pools while in winter there is a skating rink on the south grounds. During the holiday season approximately 120,000 lights are added to 300 shrubs and trees on the north grounds, creating a winter wonderland…” And on this day, casually dressed pages and volunteers were handing out bright printed Swearing In programs to adults and paper Alberta flags to kids. In the past, sometimes the populist purpose of the plaza has seemed at odds with the privileged financial elite who met within the buildings, to make decisions that benefited their friends. 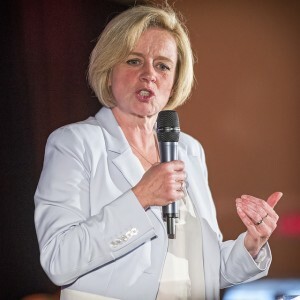 On Sunday May 24, as new Premier-to-be Rachel Notley strode out in her white blazer and bright orange strappy pumps, I was startled by the sheer volume of the crowd’s roar of approval. “A rock star welcome,” said Edmonton CTV. True, the ever efficient-NDP online contact system had sent electronic invitations and RSVPs to everyone who’d ever signed an issue petition – and followed up with a donation request, for which Notley apologised and which was quickly withdrawn. True, the farther forward I got, the more I swam through a sea of orange teeshirts, indicating NDP staffers, canvassers or other volunteers. Still, Notley and others on the platform seemed shocked by the crowd, like a couple that planned a private informal wedding and suddenly the whole town turned up. The ceremony started punctually at 2. According to my souvenir Swearing In program, the first event was suppsed to be the entrance of the Vice Regal Party, and a Vice Regal Salute. 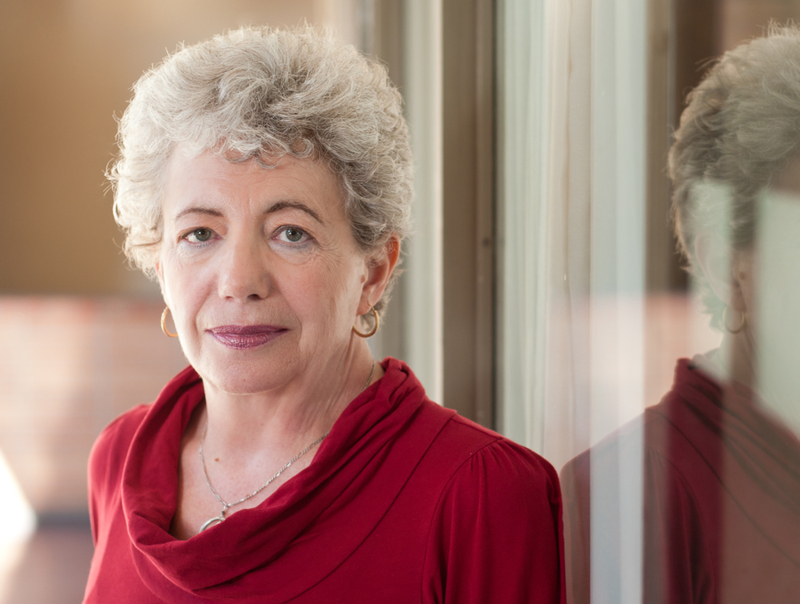 However, the LG’s chief of staff announced that since Lieutenant Governor Donald Ethell was ill with back problems, his functions were filled by the Administrator of the province – The Honourable Catherine A. Fraser, Q.C, Chief Justice of the Supreme Court of Alberta. Since the LG’s chief of staff is also a woman, as well as half of Notley’s scant 11-member cabinet, the platform looked very different from past years. As did the audience. The Vice Regal salute turned out to be abbreviated versions of God Save the Queen and O Canada. I couldn’t figure out why no one else joined in as soon as the music started, but we went from the first line to the last line on each. Done. Boom. Not even a minute for both. The Chief Justice acknowledged that the meeting was being held on Treaty 6 land and introduced two First Nation elders. Métis elder John Macdonald delivered a blessing, and Rocky Morin of the Enoch Cree Nation offered an honour song. Chief Justice Fraser read out the procedure for changing from the old government to the new one, starting with her declaration that, “I accept the resignation of Jim Prentice and his government today.” She had to pause when the crowd exploded in cheers, whoops, and whistles. Then she asked Rachel Notley if she was prepared to form the government, and Notley leaned over to the microphone to say, “Yes, I am,” to longer and louder cheers. Although I’ve been covering the women’s movement since 1976, I never imagined I would ever see such a scene in my lifetime. I closed my eyes for a moment and tried to imagine the reactions of Emily Murphy and Nellie McClung, who fought for the vote here 100 years ago. Though they formed a group that won the Person’s Case in 1929, Alberta didn’t get a woman senator until 1979, the 50th anniversary, the year I first wrote up the Famous Five. That year, accordng to this chart, I count four women serving in the Alberta Legislature, all conservatives, with maybe a dozen having served in Alberta before that. Regardless of how much she might have liked a breather, or a transition period, Notley had to be sworn in as Premier right away. Nobody was running the province. Former Premier Jim Prentice promptly resigned and walked away, not afraid to look like a sore loser. As a lame duck, interim Conservative leader Rick McIver would face a steep learning curve with little payoff. Notley comes in with a lean Cabinet, most ministers carrying at least two portfolios, while she evaluates the strengths of the newly elected MLAs. She also comes in with a very comfortable majority of 53 or 54 (depending on possible recount/appeal), about 10 more than she needs to pass most bills, which allowed her to suspend new NDP MLA Deborah Driever for her reckless social media comments and photos, but still keep her in the house as an Independent. One out of 53 ain’t bad, in this kind of total government upset. Seems to me that when John Turner lost Canada’s 1984 federal election, Brian Mulroney swept in with a host of newbie M Ps, of whom half a dozen in Quebec stumbled almost immediately. Given the urgency, Notley might have chosen a quick, private ceremony with perhaps a photo op. Or surely the Legislature’s protocol staff could have prescribed proper pomp. Instead, she stuck with the spirit of her campaign, to give top priority to at-home issues like job creation, health and education. Selecting the downtown public recreation place families go when they can’t afford West Edmonton Mall turned out to be the latest smart choice for the new Premier.